Today we get to start our look at Shakespeare’s plays being brought to life on stage and screen. I decided to start with a classic fan favourite, Romeo and Juliet. 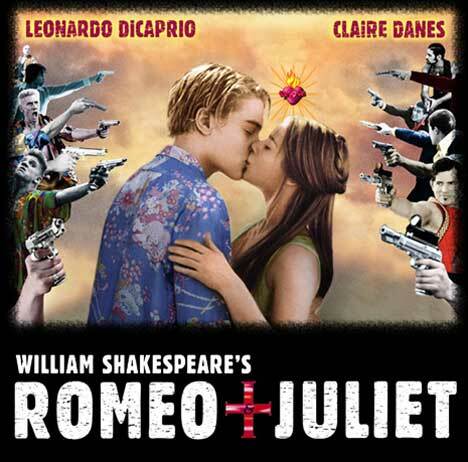 I will explore its incarnations in the Baz Luhrmann film Romeo + Juliet (starring Leonardo DiCaprio) as well as a production that I saw at London’s Globe Theatre this past April 23rd, which happens to be both mine and the Bard’s birthday, as well as the Globe’s opening night. In a nutshell: In two short hours, Shakespeare plans to tell the tale of two families whose enmity has caused calm, lovely Verona to be overwrought with violence. The heirs of the families meet and fall in love at first sight but their love is doomed, as their families’ hatred makes their love virtually impossible. I say virtually because they can only consummate their love in death, which is their tragic ending. This tragedy finally brings about reconciliation between the Montagues and Capulets. Now, the whole ‘boy meets girl, boy and girl fall in love, their parents forbid their love’ story is a tale as old as time and humanity itself, and therefore can be applicable in any time and culture. So let’s see how two different directors, Luhrmann and the Globe’s Dominic Dromgoole, go about transforming the text through different mediums that reflect two very different cultures. Standing as ‘groundlings’ with my friends in the low-cost standing space at the Globe, we really got a feel for how the plays were performed in Shakespeare’s time. Just as in his time there was minimal set design – this prompted us to use our own imaginations when today we are used to being bombarded by visual stimulants. The actor who played Mercutio, Romeo’s best friend, really played up the Renaissance model of appealing to the lowly ‘groundlings’ by making the most vulgar gestures, gestures that made today’s patrons blush. The part I enjoyed most was the traditional Globe finale, where all of the actors did a jig together. After spending the end of the play crying, it was so touching to see the dead rise and those who began the play in deadly enmity hold hands and laugh together. Then again, what also made me teary was the prolonged time I was standing stationary on my feet. I know that people in Shakespeare’s time might have been used to it, but I wasn’t. None of us were expecting the production to be as long as it was, first because Shakespeare promises only ‘two hours’ traffic’ of the stage and secondly: we’re used to the Luhrmann. Luhrmann gives us the general gist of the story while cutting a whopping 60% of the text, leading some to say that he’s ‘bastardized’ it. I wouldn’t go that far. I think he creates a genuinely touching image of the young lovers; what he did, he did well. What he cut out was Shakespeare’s deeper look into the lives of the supporting characters. Dromgoole took his time at the expense of my weeping feet, but it was worth it to see the way he delved into the Nurse’s tragic past (having lost her own daughter) and the hilarious Capulet servant, who provided much-needed comic relief and reminded us that the civil war is not only between the nobility but rather involves everyone in fair Verona. Nonetheless, Luhrmann deserves credit where credit is most definitely due. His newscast of the prologue with quick flash-forwards to the end of the play bring the prologue to life as if own imaginations are doing the flash-forwards before we’ve even seen the events of the play. The music selection is out of this world – modern songs like The Cardigans’ ‘Lovefool’ highlights the joy of young love and Des’ree’s ‘Kissing you’ stops the fast-paced world of Montague-Capulet violence so we can watch two innocent people fall in love. Most of all, I think that the way that Luhrmann incorporates guns makes not only a strong statement about the problems with gun violence in North America today, but also connects this contemporary issue with the abounding violence that casts a tragic shadow over the beautiful love story of Juliet and her Romeo. So let’s consider the difference between the true-to-Shakespeare’s time, full-plotted Dromgoole and Luhrmann’s uber-modern teenage love fest specifically in terms of their medium. You would assume that a movie could be longer (like Titanic or Kenneth Branaugh’s 4-hour Hamlet) because people can sit down and enjoy it, pause it, or watch it in increments, but I think he kept the film to the prologue’s promised ‘two hours’ traffic) to maintain the tighter plotline and keep within teen attention spans. Dromgoole, in contrast, kept the whole text intact, regardless of my sore feet and the unpredictable London weather that could have poured in from the open roof at anytime. I think that his choice of intermission was too far into the play, causing my feet to be my top priority since I couldn’t press ‘pause’ or walk out mid-performance. This would be especially inappropriate at the Globe. 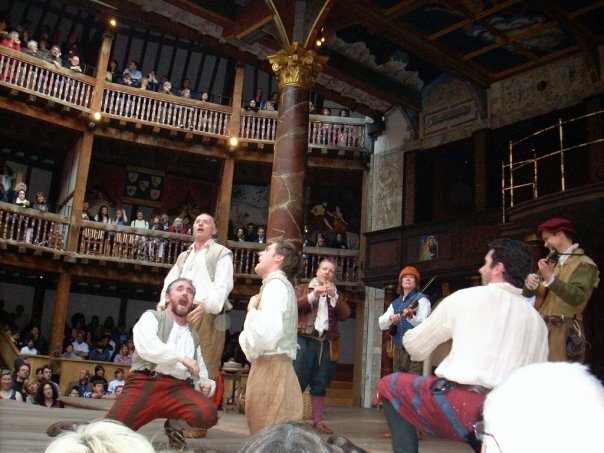 At the Globe, you not only watch the actors: the actors have full view of the audience and the last thing I wanted to do was incite Mercutio’s fury on myself! Nonetheless, I think this choice of length was once again inspired by Shakespeare’s age: back then, people had longer attention spans and were used to sitting down for hours on end, listening to long sermons at church. So which is better? Well, that’s subjective. People of my generation probably prefer to watch that heartthrob ‘Leo’ fall in love; the scene of their first kiss (well, that’s face it: every scene) chokes me up every time. Luhrmann had a high budget and used it appropriately on well-known actors, resplendent costumes, and a killer soundtrack. It’s a Romeo and Juliet firmly placed in our time, and the media of film matches that message while reminding us that we can relate to Shakespeare’s stories today, even though they were written so long ago. The acting by the lead characters in the Dromgoole production was alright, but it was the supporting actors that made the Globe shine. Dromgoole performance was touching first and foremost because Shakespeare’s words are touching, and there is no discounting the fascinating experience of seeing the play in its original medium. So how do I conclude? I think that, in the end, I return to my original assertion from my last post: if I want to enjoy the full Shakespearean text as interpreted ‘appropriately’, I will read it myself and use my own imagination. If I want to see it as Shakespeare’s troupe produced it, I’ll stand all night at the Globe. But I will be honest: I do not fear new media nor do I reject the possibilities it opens up within the text. In both the 100% [of the original text] stage version and the 40% screen version, there were elements that fit my interpretation of the text or didn’t. Even more important is to see what elements go beyond my interpretation, bringing me closer to the characters and emotions brought forth by Shakespeare’s words. And that, I think, came from Luhrmann. Even though many of you probably watched it at a house party in your teens, I strongly advise you to watch it again. The music, the humour, and the way that Luhrmann exposes the inherent truths from Shakespeare’s original texts into a modern setting and media are truly enlightening and make it a film I can watch over and over again. I loved the Franco Zeffirelli version when I was a teen- cried too! I love the ballroom scene! It’s so different from the Luhrmann version (Z is hurried, L stops time) and it’s amazing to see the effect you get from both! When I directed R&J, I took a modernized approach as well. I was conscious of the fact that Romeo And Juliet is on the reading list for several area high schools, and wanted to be able to link up with that. I was very, very happy with my lovers… I think that part of the story worked just as it should, and the primary theme in feedback we were given, was that the lovers felt very personal, seemed believably passionate, urgent, vulnerable and so on. Since DiCaprio has transitioned into a better actor with “The Departed”, “Gangs Of New York”, and “Blood Diamond” it would be interesting for me to see how he might treat Romeo if he were able to go back in time. He looked the part then, but I don’t think he gave Romeo what Romeo deserves, unfortunately. I thought the Capulets were wonderful! Paul Sorvino was that great mix between a loving father while also being someone who frantically wanted control in a world where his family’s reign was unsteady. Mrs. Capulet was also great – she threw on that ambitious southern belle accent that made the audience realize that she, too, married for advantage, but that she’s enjoying the advantage. When I saw her as Gertrude in Almereyda’s Hamlet (Ethan Hawke, 2000), I didn’t even realize it was the same woman! I’ve not seen Ethan Hawke’s Hamlet. If you suggest it as worth seeing I might have to look into finding a copy at some point. Hamlet is a tricky one, though. There were elements I liked in Mel Gibson’s, (I think Zeffirelli directed it.) Paul Schofield as the ghost was wonderful. There were elements I liked in Kenneth Branagh’s, namely Derek Jacoby as Claudius. There was pretty much nothing I liked in the Richard Burton ‘plain clothes’ version directed by John Gielgud. I saw a decent version at the Oregon Shakespeare Festival, directed by Libby Appel. Roundabout 1999 or 2000, I would say. And I wish I had been able to see Peter Brook’s version which he took on tour a few years back. It was playing in Seattle (relatively near me) but I read about it like a week or so after it left. I also wish I had been able to see the RSC version in 2003 or 2004, with Toby Stephens. Ethan Hawke’s is definitely worth a watch. There is, of course, the celebrity quality, but it also brings the themes of surveillance even further to the surface, and even further into modern times (although 10 years after its release, some of the technology seems a bit outdated…but we get the picture). I quite liked the Gibson, too. Glenn Close played such an immature Gertrude which made me uncomfortable…until I realized it was intentional and, dare I say, genius to play Gertrude as a girl in love. Awkward, because she’s so old, but it was awkward to Hamlet!!! Helena Bonham carter was so young, with those big eyes, and made a wonderful Ophelia, and Ian Holme’s height (or lack thereof) makes him a great Claudius that you just want Hamlet to flick. Jacobi was a flippin’ wonderful Claudius. I looooved how they used blue eyes for all three male Danes because it made Hamlet’s parentage questionable: Hamlet Sr., or Claudius? Maybe he’s more like Claudius than he wants to be!! I saw the Grandage/Jude Law version on London’s West End and I thought it was wonderful. I still prefer the movie versions, but Jude Law was very, very funny, which is important. Despite the fact that the play is a tragedy, Hamlet creates so much comedy within his plight. Hi there! You can find me on twitter @TheBardolator ! Thanks for reading!